This is the final time I shall be posting updates about the magazine I've nurtured for the last ten years, including the last three years as a joint title. 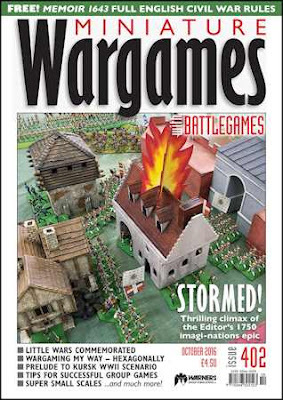 Next month, it reverts to its former name of just Miniature Wargames and Battlegames will be just a memory – a fond one, I hope. And of course, you'll be able to continue to get hold of digital versions of Battlegames via my shop and Gladius Publications. Issue 402 marks a major shift, the last of one era of the magazine and the prelude to a new future. Outgoing editor Henry Hyde has made sure that his last issue packs a punch, covering a broad range of topics as always. Publication date is 23rd September. In Prelude to Kursk, the last instalment of The red empire strikes back – fighting the Great Patriotic War one battle at a time, Andrew Rolph concludes his series of Ostfront scenarios with the Germans making a brave bid to pinch out one of the Russian salients near Kursk. In Memoir 1643, Arthur Harman provides a complete set of rules for 17th century battles played on hex terrain, owing much to popular 'crossover' boardgames, with glorious photos of Andrew Brentnall's magnificent 12mm ECW collection. In Little Wars – the first miniature wargames, Benjamin Bourn celebrates the man who got it all started, back in the mists of time – the master storyteller and wargame inventor H G Wells. In Grenouisse at bay part 4, the outgoing Editor takes us into the final chapter of the Grenouisse at Bay campaign, the latest instalment of the never-ending Wars of the Faltenian Succession. The players wanted action – and they got plenty of it! Craig Armstrong tells us It's the little things, extolling the virtues of sub-28mm gaming and exhorting you to tread the tiny path. And finally, we have a show report from The Other Partisan 2016 by Neil Shuck who travelled to Newark on our behalf. In his Briefing the Editor bids a fond farewell to the magazine he has nurtured since 2006, wishing it and its loyal supporters well. In World Wide Wargaming, the Editor takes his final reconnaissance flight over the digital front line, where our hobby is evolving at the speed of light and providing us with new opportunities. The Editor completes his regular spots this month with Forward Observer, steadying his binoculars to scan the wargaming horizon and see what's heading our way. Diane Sutherland gives us Spanish walls in her Continuing tales of a wargames widow. She has been dreading husband Jon's demands for even more scenery, so now she pins him to the table, mutters "Nuestra casa tiene altas paredes blancas," and picks up the knife. In Fantasy Facts, John Treadaway scans the forthcoming fantasy and sci-fi horizon and finds that it is full of delights for the discerning gamer. In Hex Encounter, board game specialist Brad Harmer-Barnes posts his valedictory column, casting a fond look over his shoulder at the hexes he has encountered along the way. In his Send three and fourpence column, Conrad Kinch provides thoughts on wargaming as a group endeavour. The Editor gives a special Battlegames Combat Stress Appeal report this month, which includes a new initiative, the Combat Stress Kit Collection, which makes it possible for you to send kits, miniatures and wargaming accessories direct to the veterans undergoing Occupational Therapy. Please help! And finally, our regular review slot Recce. Our front cover photo, by the Editor, was taken as fire took hold as Prunkland's forces stormed the city of Contre Rivière in the climactic battle of the Grenouisse at Bay campaign described in these pages. The figures are mostly 30mm plastic Spencer Smiths of 1970s vintage, with a some Foundry. Remember also to check out the Downloads section on the website for additional material. My very best wishes to new editor John Treadaway as he takes on this difficult job. Roll 'em High – & Farewell!